WE ARE DELIGHTED TO PRESENT TO YOU THE CITROËN C5 AIRCROSS AT LMC FARNHAM. 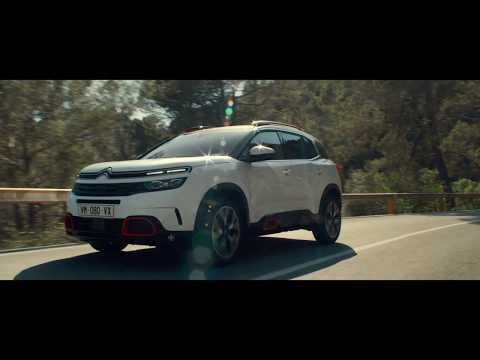 New Citroën C5 Aircross is in a league of it's own! Its robust and muscular design and its raised ground clearance of 230mm. Its unique personality and strong style choices such as its Airbump® inspired lower door and wheel arch protectors, roof bars, and a broad range of personalisation options make it 100% Citroën in its design and character..
With a robust and muscular design, the C5 Aircross stands out for its powerful dynamic personality, it brings a fresh look to the SUV segment. Its wide and powerful front-end design, high sculpted bonnet and flowing lines punctuated with strong graphic features such as the Airbump®. From The rear, its wide and tall appearance, suggests a class-leading boot space (from 580 to 720 litres). The rear headlamps are fitted with four LED oblong modules on each side of the vehicle. The C5 Aircross boasts a panoramic sunroof. The 360° glazed area around the car shows off a flowing roof design and the "C” chrome-finished signature reflecting its interior space. The cabin of New C5 Aircross SUV is spacious and stately. It incorporates generous and flowing shapes, while remaining attentive to functional aspects. It features a robust dashboard with a horizontal layout. On the driver side, the display screen offers a configurable digital instrument cluster with a 12.3'-inch screen, which displays the selected driving information in the driver’s field of vision. The wide and tall central console and the inviting seats set high give you a feeling of control over the road, and the choice of colours and materials all add to the impression of personalisation and refinement given by the interior. New C5 Aircross SUV offers a range of efficient and powerful Euro 6.2 engines, with the 6-speed manual gearbox or the 8-speed automatic gearbox: 2 petrol versions: PureTech 130 S&S, 6-speed manual and PureTech 180 S&S 8-speed automatic and 3 Diesel versions: BlueHDi 130 6-speed manual, BlueHDi 130 S&S 8-speed automatic and BlueHDi 180 S&S 8-speed automatic. • Its fuel consumption is up to 7% lower compared with the 6-speed automatic thanks to the two additional gears. • The two additional gears provide smoother gear shifting by reducing the intervals between gear changes. New C5 Aircross SUV comes with a broad range of driver assistance systems, with 20 technologies for safety, comfort, and simplified driving! • Highway driver assist, This system represents a first step towards autonomous driving, as it allows the car to handle its own speed, trajectory and lane position functions. It combines adaptive cruise control with the Stop&Start function, enabling the car to stop and restart automatically based on the movement of the car in front of it. • Extended traffic signs recognition, It recognises speed limit signs and displays this information on the instrument panel. This speed can be selected as an instruction for the speed limiter/cruise control in one simple movement. In addition to speed limit signs, the system recognises certain road signs and transmits the information to the driver via the instrument panel (Stop signs / One-way signs / End of speed limit restriction). • Automatic high-beam function, It makes driving at night safer and more relaxing thanks to the automatic management of high- to low-beam headlights (and vice versa). New C5 Aircross SUV provides passengers with intuitive systems at the cutting edge of technology to offer them continuity between their digital universe and their car: the 8'' tablet with a capacitive touchscreen, which allows users to adjust their car’s settings, access the multimedia system, telephone, air conditioning, and navigation system, as well as: the Mirror Screen function, Citroën Connect Nav. The Citroën Connect Box with SOS & assistance included, wireless smartphone charging and ConnectedCAM Citroën® complete this extended connectivity offer. If you would like to get to know the Citroën C5 Aircross better, you can enquire online or call us now to speak to one of our sales representatives.